When I first started a food blog, I had no idea what would come of it. I thought maybe I would give up a few months in, citing poor photography skills and not enough time, or that I would just keep it hidden away, not really sharing with others, because who is reading my crazy brain thoughts anyway? What I never would have expected though, is the sense of community and the amount of internet (and real life!) friends it would bring me. I have been lucky enough to meet some of the most talented and thoughtful individuals through food blogging, one of which is Christina over at Dessert For Two. Christina is one of the first food bloggers I e-mailed with questions about food blogging and setting goals in this big wide world of seemingly daunting and endless work. Her drive and talent for making her goals into tangible reality is constantly inspiring and reminding me that, with a little elbow grease and a lot of passion, dreams really can become a reality. Recently, Christina came out with her long-awaited cookbook, Dessert For Two, recently and when she offered to send me a copy, I jumped at the chance. While her book doesn’t have any vegan recipes, I’m making it my mission to find modifications for them, starting with these easy peanut butter chocolate cookies. Since I’ve been laid up with a cold the past few days, I knew I didn’t really have the energy for a time-intensive recipe, but we still really needed a few cookies around the house (need, not a want, right?). 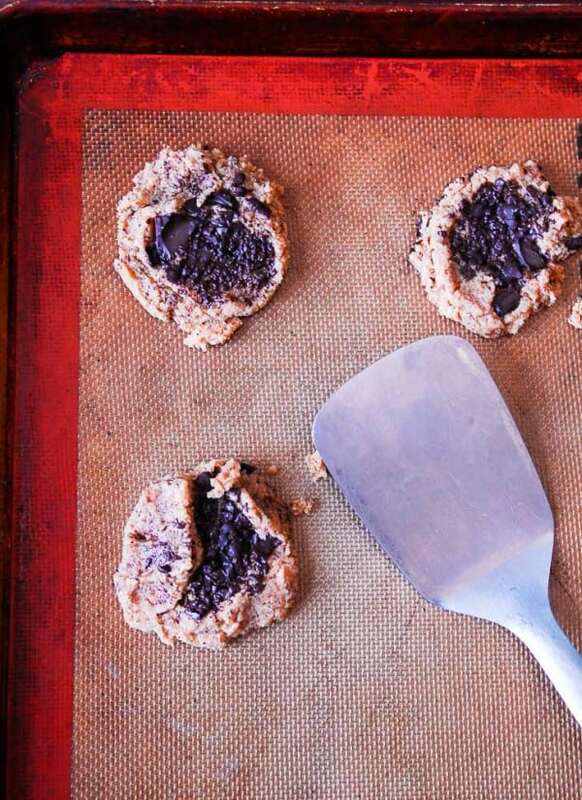 When I spotted the recipe for these four ingredient cookies in Christina’s book, I knew these would be my first vegan-izing experiment, and I am so glad they were. Really, the only thing I changed from the original recipe was subbing in a flax egg for a regular egg, which still made them turn out perfectly. The four ingredients satisfy the need for cookies, a salty dessert and a sweet dessert, all at the same time. 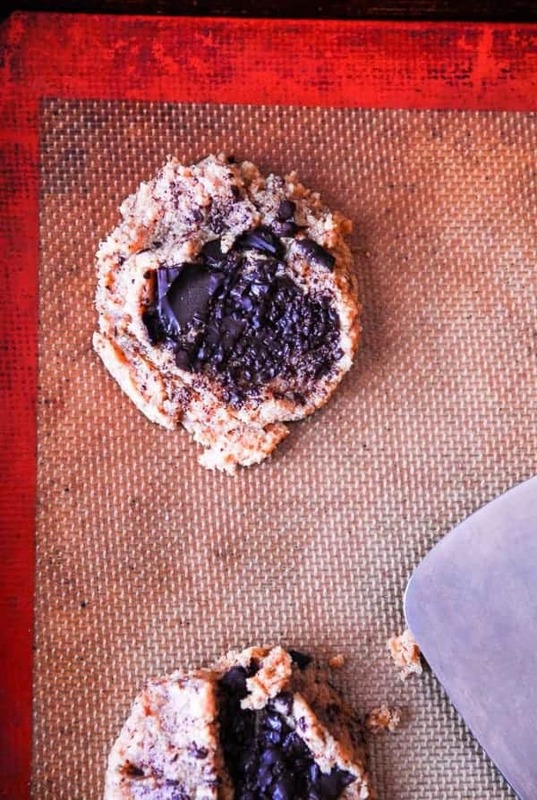 The cookies crisped up just enough to make a perfect cookie, while still retaining the soft, chewy quality that makes for the ultimate batch of sweet treats. I used homemade peanut butter in my batch, so in case you were wondering if these work with the homemade stuff, they do! Make sure you let them cool for a few minutes before you try nabbing them off the cookie sheet, or they will crumble up and not stay in a nice cookie form, but really, they taste wonderful either way. These easy four ingredient vegan peanut butter chocolate chunk cookies are the perfect quick sweet treat! In a small bowl, combine the ground flax seed and water and set aside for at least 5 minutes. In a medium bowl, stir together the peanut butter, granulated sugar and flax egg. 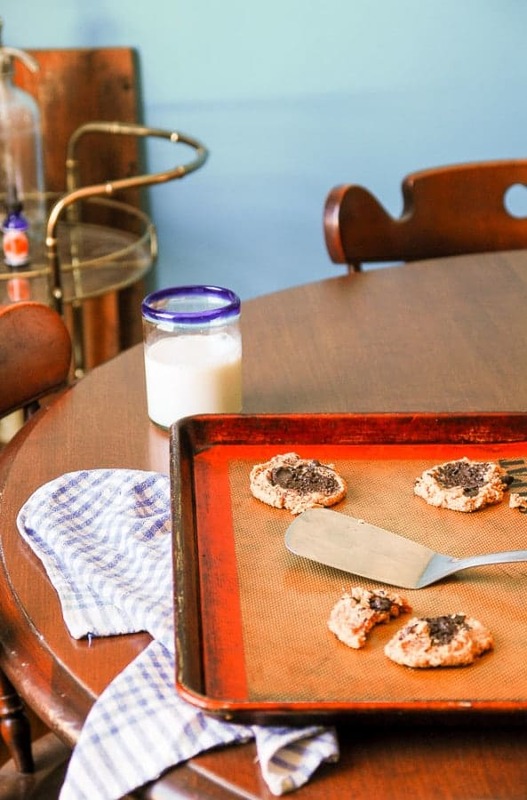 Drop by the tablespoon onto the cookie sheet and press the chocolate chunks into the tops of each cookie. Bake for 10-12 minutes, or until edges are starting to brown. Remove and let cool for at least 10 minutes. Yeeeeeeah I love Christina! And her cookbook! I still haven’t had the chance to whip up any of her recipes but they all look so tasty. 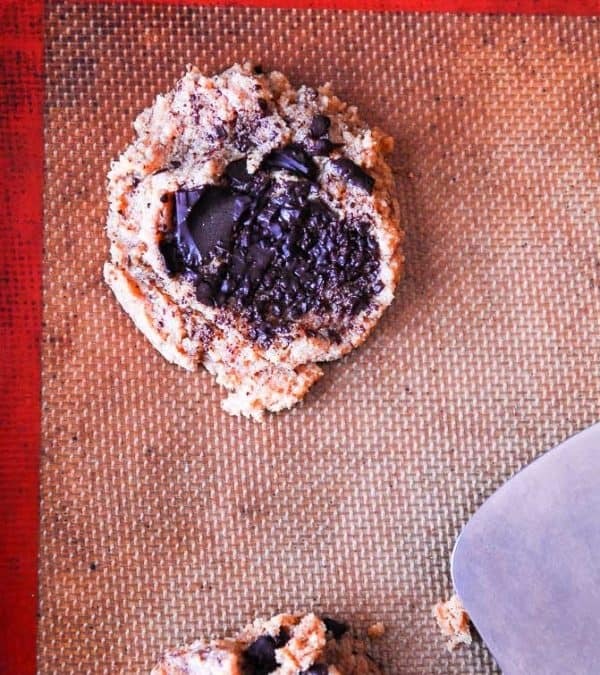 These 4-ingredient cookies sound amazing and I love that you made them vegan. Bravo, m’dear! Your blog is one of my all time faves! Love these cookies- and that they’re gluten free 🙂 Pinning! This is exactly what I need in my life right now. Yep. You SO need these in your life! How great you were able to veganize these! I usually make 2 dozen cookies each time I bake, so it will be fun to try a small batch! Glad you stuck with it! Love the sound of these cookies. I’ve always wondered if flourless PB cookies would work with a flax egg! Ummmm this is awesome. Hello, easiest cookie ever! I think these could totally be considered a breakfast cookie, right? Also, I’ve really found flax eggs to be the best egg sustitute. I first used them for Minimalist Baker’s waffles. They just work so well and then you’re also sneaking flaxseed meal into whatever you’re making! Love it.